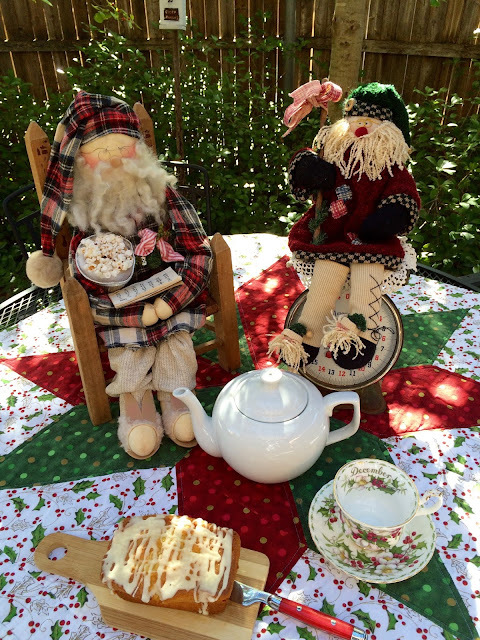 My fireside tea is being hosted by another of my baking Santa's. 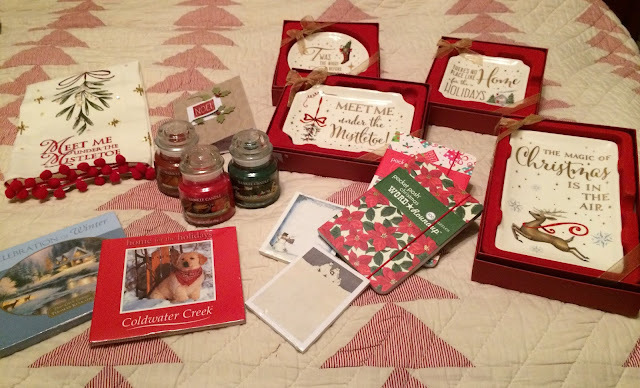 I'm using some of the gifts that I won from Gina's most generous giveaway. 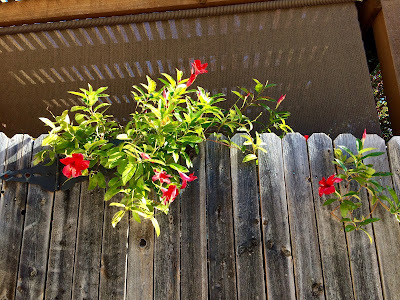 Gina blogs at With Twigs and Branches. Please stop by and tell Gina "hi". The bouquet of roses that I'm using as my centerpiece is from my sweet friend Stephanie, from The Enchanting Rose. The bouquet was delivered from The Bouqs Company and I must say that they are extraordinary! What a lovely surprise they were! Thank you so much, Stephanie! I'm using my Merry Christmas teacup from Johnson Brothers. Isn't this the sweetest, most old-fashioned pattern? Perfect for a girl like me! This little Santa was given to me from my late beloved hubby, and has a special place in my heart. 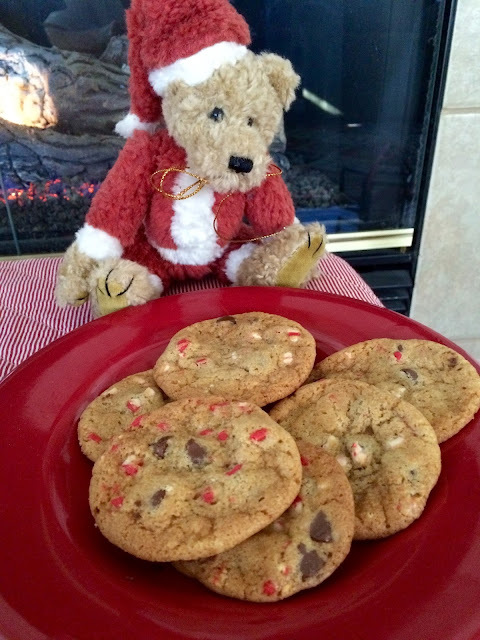 Santa is checking over the cookies that are oh so tasty. Please help yourself, as I think you'll love them! If you already have a favorite chocolate chip cookies recipe, just use half milk chocolate chips and half of the Andes Peppermint Crunch chips, in place of the two cups of semi-sweet chocolate chips. In a small bowl, whisk together the flour, baking soda, and salt; set aside. Using a stand mixer fitted with the paddle attachment (or in a bowl by hand), beat together the butter, brown sugar, granulated sugar, and vanilla on medium speed just until smooth, about 2 minutes. Beat in the eggs one at a time until thoroughly incorporated, then stir in the flour mixture followed by the chocolate and peppermint crunch chips. On a lightly floured work surface, divide the dough into quarters. Shape each quarter into a log about 9 inches long. Wrap the logs in plastic wrap and refrigerate until firm, preferably for 24 hours . I froze my logs). Position racks in the upper and lower thirds of the oven; preheat the oven to 350°F. 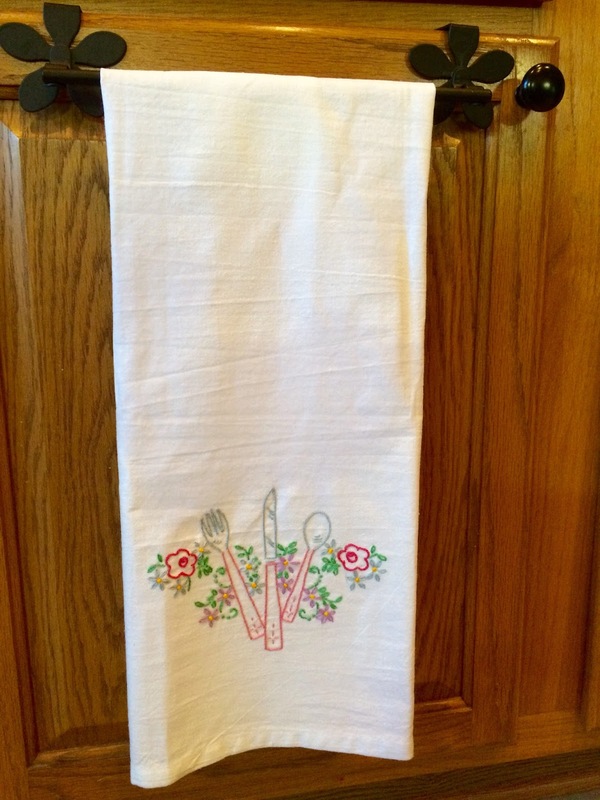 Line 2 baking sheets with parchment paper or silicone baking mats. Slice the logs into disks ¾ inch thick and place the disks 3 inches apart on the prepared baking sheets. If the chips crumble out, simply push them back in. Bake, rotating the baking sheets midway through baking, until the cookies are very lightly browned in the centers, about 10 minutes. If you like soft chocolate chip cookies, err on the side of underbaking. Let the cookies cool on the baking sheets until firm enough to handle, then use a spatula to transfer them to a wire rack. Look at all these wonderful gifts that I received from Gina! Thank you so very much from the bottom of my heart, Gina! 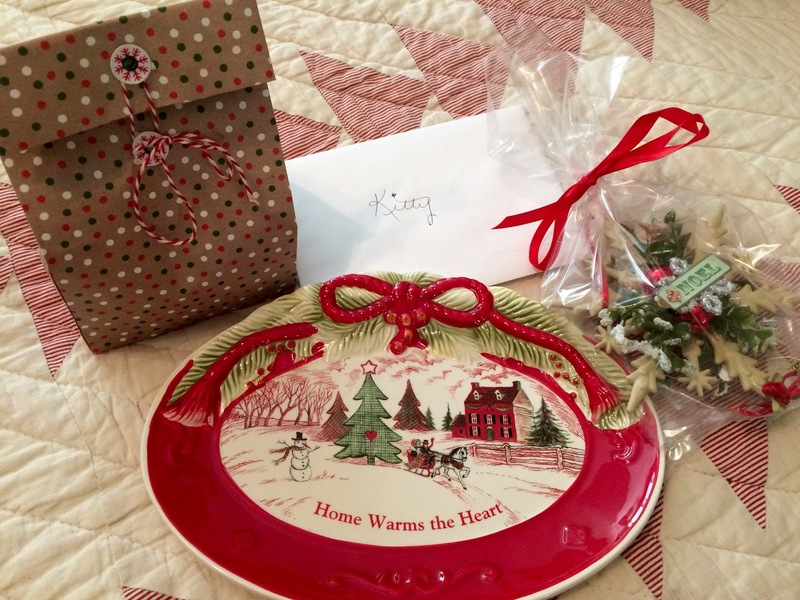 I was overwhelmed by your generosity, and have enjoyed the Christmas CD's, the beautiful dishes, the darling towel, the three Yankee holiday scented candles, the notepads and the books. The handmade card was soooo beautiful! What creativity and love was put into that. I so appreciate everything. 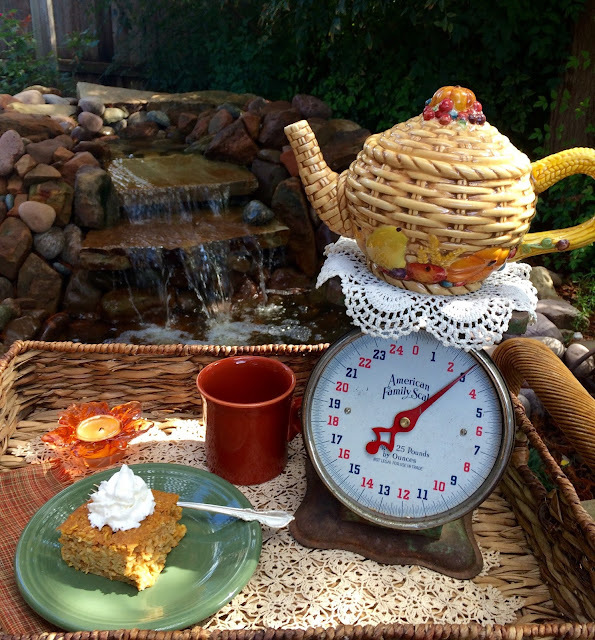 It was so warm in the Dallas area this past week...almost up to 80 degrees, that I set up my tea table outdoors! The quilted topper is one that I made several years ago. 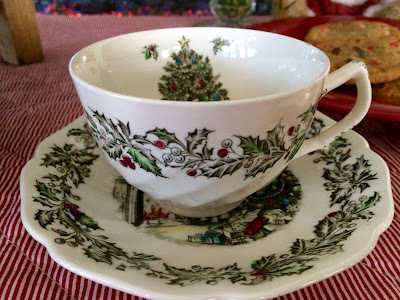 I love how the holly print in the fabric matches the holly in the teacup. This pretty December Royal Albert teacup was gifted to me by dear friend, Rosie, which came from her late Mother's collection. 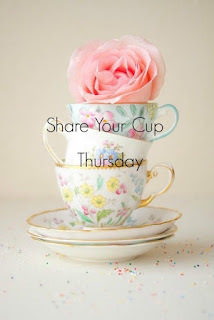 I just treasure it and it is my only teacup of the month that I have. 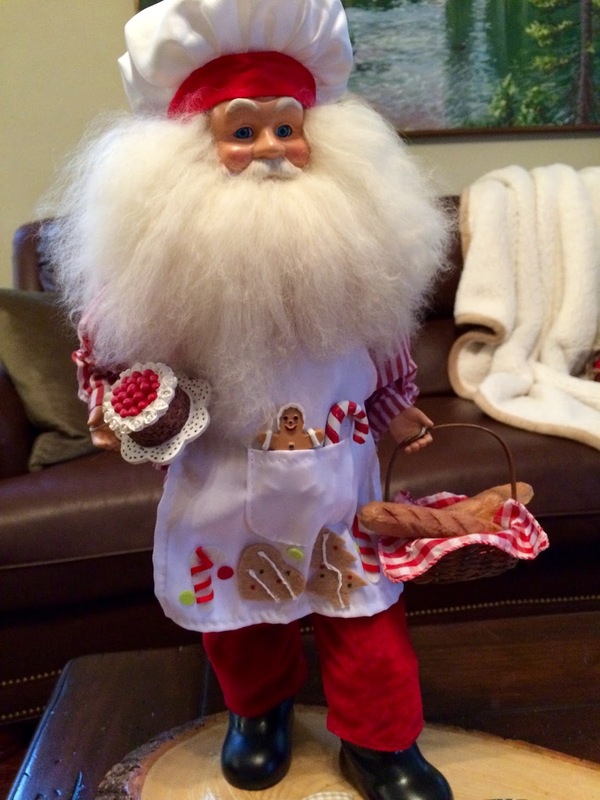 This cute Santa was one that my daughter bought for me and I just love him. Isn't he sweet with his nightshirt and nightcap, and his bunny slippers? His calendar is dated 1996 and I'm thinking that poor Santa really needs a fresh bowl of popcorn! It's held up pretty well, don't you think? My daughter and I used to exchange Santa's each year. My daughter also gave me this Santa! 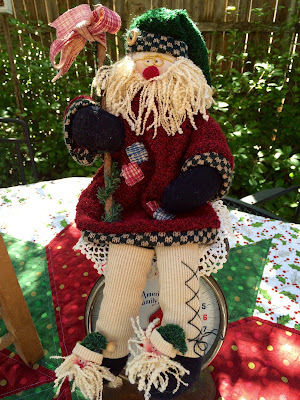 Notice his Santa slippers and I love his checkered trim on his clothes. Preheat oven to 350 degrees. Grease bottom only of a 9x5-inch loaf pan, or three 3x5-inch loaf pans. (I made four mini loaves). Blend together the eggs, eggnog, rum extract, sugar, vanilla and butter. Sift together the flour, instant vanilla pudding mix, baking powder, salt and nutmeg. Add to eggnog mixture and stir just enough to moisten; pour into prepared pan or pans. Bake large loaf for 40 to 60 minutes, or until a tester inserted in the center comes out clean. Breads baked in the smaller pans require 35 to 40 minutes. Cool for 10 minutes, and remove from pan. Cool completely, wrap tightly in plastic wrap or foil, and store in refrigerator. My mandevilla vine is still blooming! 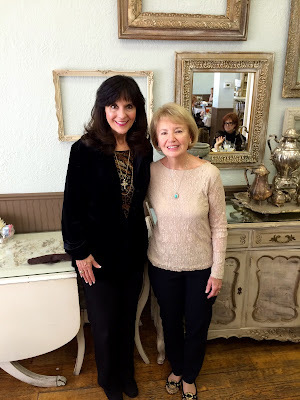 Oh my goodness, I must tell you about the wonderful meeting that Celeste from Southern Daydreams and I had at a tea room! Here I am after opening the lovely Fitz and Floyd platter that Celeste gifted to me. 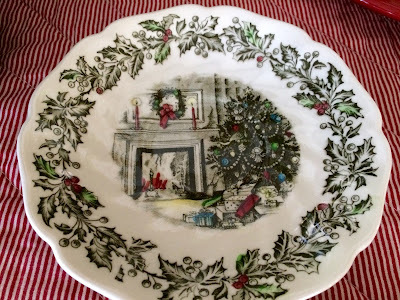 I made Celeste some Christmas Jam, a loaf of bread, from my Civil War starter, and a teacup coaster, fashioned after the ones that Stephanie, from The Enchanting Rose makes. Stephanie is the reason that Celeste and I became friends, as she placed me as the recipient of Celeste's teacup exchange. Celeste lives not that far away from me, as we found out, and we wanted to meet each other. Here we are posing in the shabby chic tearoom! Celeste is as beautiful on the inside as on the out. Guess who joined us?? 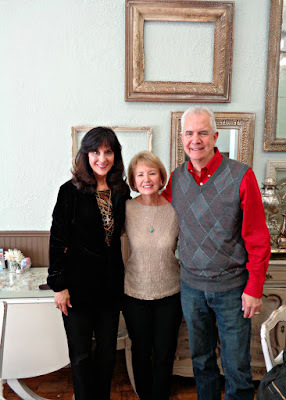 Celeste's dear hubby fit right into our tearoom lunch. Her hubby and I had a lot in common as we had, at one time, worked with some of the same people, we discovered. Do you notice Larry's clothing colors? Yes, he loves Ohio State, also! The dear, sweet man even said a blessing before we had our lunch. We all chatted away for over two hours, just like we were old friends that have just picked up where we left off! Larry even treated me so generously to my lunch, and besides all that, he bought each of us the most delectable macaroon at the tearoom's bakery to take home!! It was such an honor and privilege getting to meet them. You can just tell that they both love and adore each other. As we were leaving the tearoom, Larry and Celeste so thoughtfully walked me to my car. I watched them as they walked to their car, grabbing each others hand, just as my late beloved and I always did wherever we were. It brought back loving memories for me. Just look at the generosity of Celeste! Isn't the platter so nostalgic and with such a sweet saying? Inside the bag are candies that Celeste made for me to put on the platter. 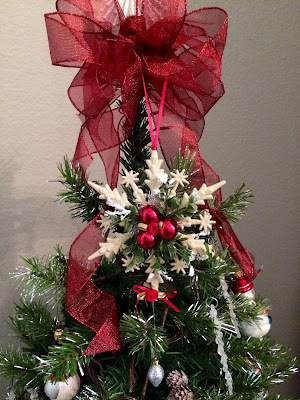 If that was not enough, she made me an ornament, that is embellished in Celeste's own style! Here's my yummy macaroon (it was enormous and yes, I ate the entire thing! ), and a few of the candies (oh, are they ever good!). 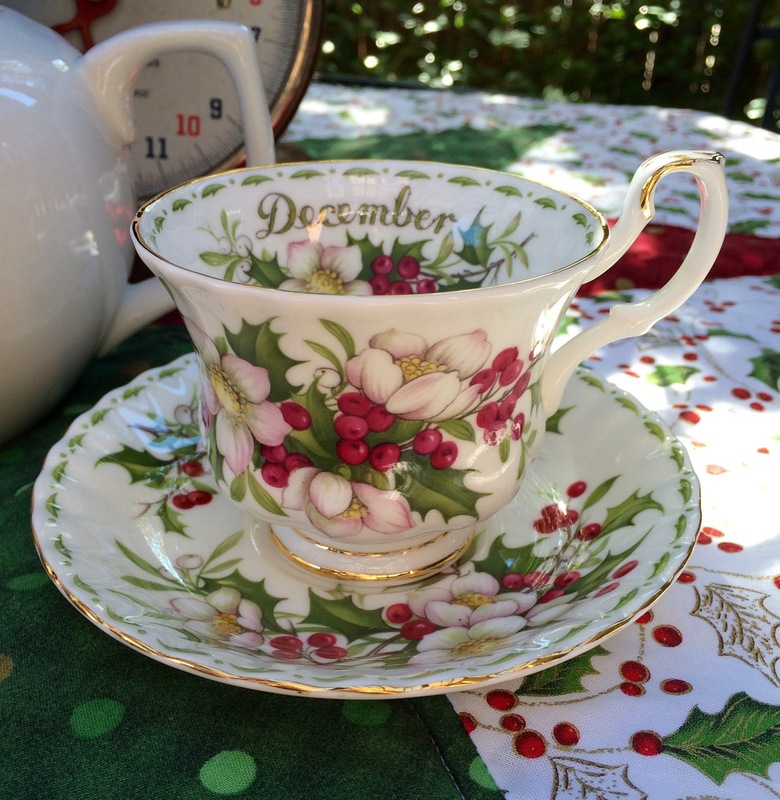 I'm having a cup of Holiday Tea, from Harney and Sons to keep me in the Christmas spirit. Here's the front of the gorgeous ornament. 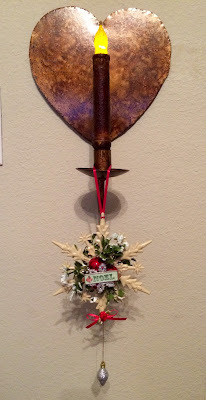 Here's the back of the ornament, which is just as pretty as the front. Thank you to Celeste and Larry for a wonderful afternoon of friendship, and for driving over near to me. We were so sorry that our friend, Pat, from Gypsy Heart and Soul, who we were hoping to meet, could not join us, as she was not feeling well. We will definitely plan another time to meet. Hopefully, Larry will join us again! Thank you to our dear, sweet friend Stephanie for making all this possible to begin with...all through a cup of tea! 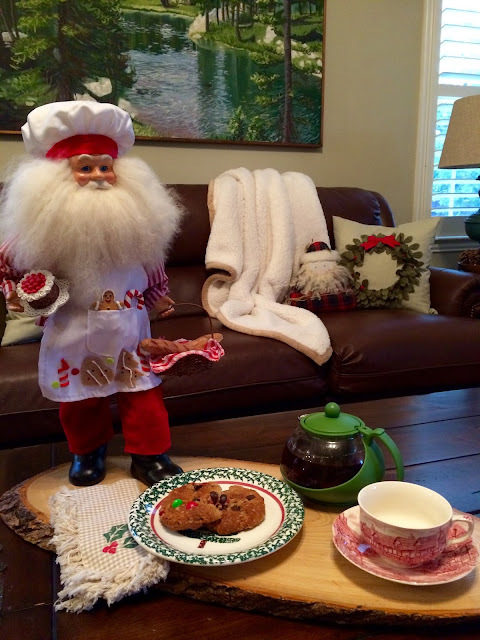 My baking Santa is joining me for tea at the coffee table today, and I'd be happy to share a cookie with you. We're also having some decaf vanilla tea, which is so heavenly. 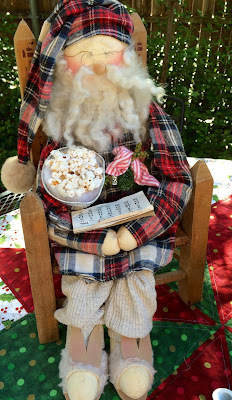 Isn't this Santa adorable? 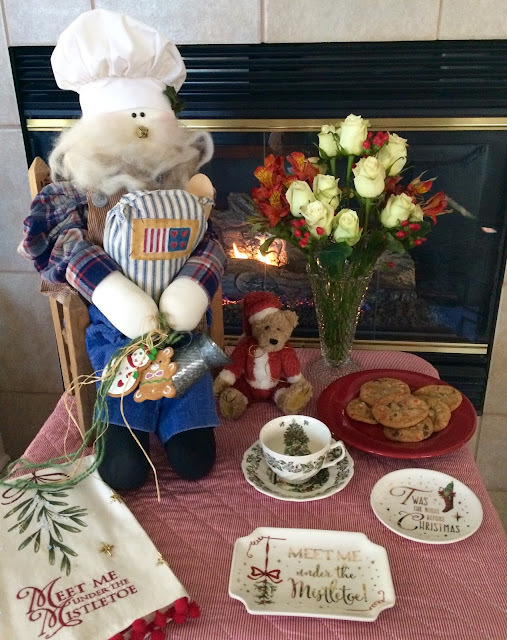 At Christmas time, he resides in my kozy kitchen. When I was in Ohio last week, to cook Thanksgiving dinner for my dear Mom, my sweet sister had bought me this darling teapot from World Market. It looks so small, but surprisingly when full, it holds about 4 cups of tea. 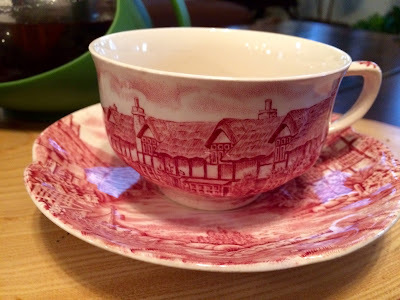 I'm using my Johnson Brothers Olde English Countryside teacup. I love to mix and match my dishes. I love how the teacup blends with the Target dishes that my late beloved and I scoured the stores for years ago. 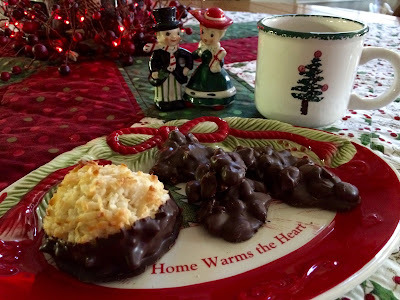 I know that I've written about these cookies before, but they are so good that I wanted to include them again, as a Christmas version. They don't contain any flour, which is great for a gluten free diet. I don't have that problem. 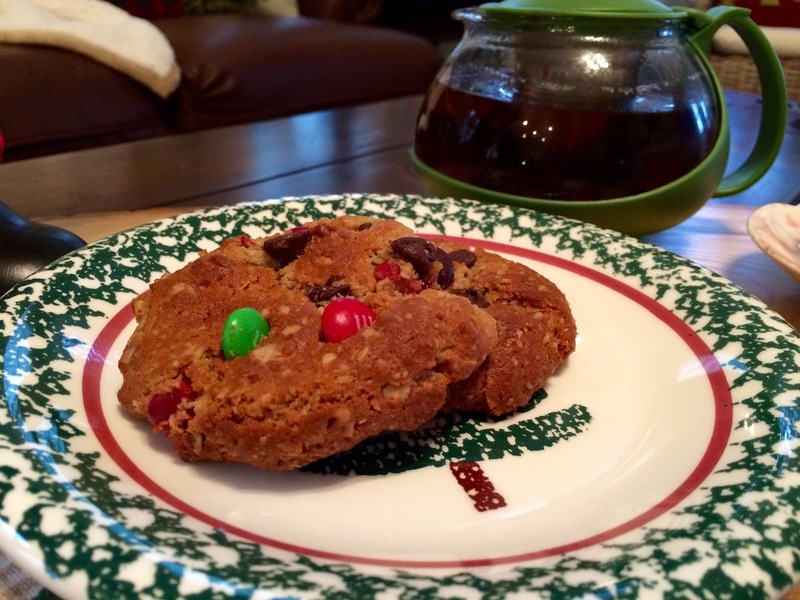 I just happen to love these cookies, and I hope you'll try them. Beat butter, sugars, peanut butter and eggs in large bowl until well blended. Blend in baking soda, vanilla and oats until well mixed. Stir in chocolate chips and candy pieces. Scoop out about 1/3 cupful of dough for each cookie. I use an ice cream scoop instead, which is about a 1/4 cup. Place on prepared cookie sheets, spacing about 4 inches apart. Press each cookie to flatten slightly. Bake 15-20 minutes or until firm in center. I only bake mine for 15 minutes. NOTE: I now scoop the cookies and freeze them on parchment paper. After they are frozen, I transfer them to freezer proof bags and take out and bake when needed. Makes about 18 cookies, if using 1/3 cup, or about 30 with the ice cream scoop. We had another session of Nana's Cooking Camp over the weekend and made some Turkey Pops, but first we went to see The Peanuts Movie in 3-D! Oh my goodness, do I ever love 3-D movies!! We had so much fun!! 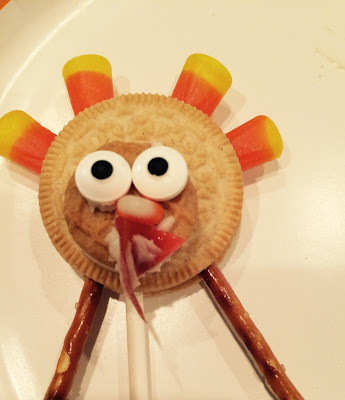 This turkey pop that is pictured is actually one that one of the kids made. Twist apart a vanilla sandwich cookie and apply a little icing on one cookie half. Press two halves back together. Insert coffee stirrer into the cookie sandwich. (You also could just leave this step out). Apply a small amount of icing to the back of the Nutter Butter Bite and press into the face of the vanilla cream sandwich. Insert four candy corns into the top half of the cookie for the "feathers". Apply a small amount of icing to the back of the candy eyes and put onto the face of the Nutter Butter Bite. Break off the tip of another candy corn to make the turkey's "beak", and affix to the face of the Nutter Butter Bite, just below the eyes. 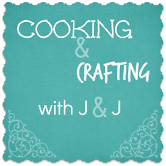 Cut a triangle of fruit leather or roll-up and affix beneath the beak with some icing. Insert two pretzel pieces into the icing at the base of the cookie sandwich and you're ready to gobble your turkey pop! 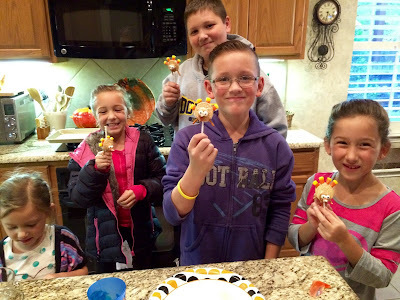 These kids love to have cooking fun! The two below are my oldest (15) and my youngest (1) that don't participate, but I soooo love being with them! We are still enjoying some nice weather here in the Dallas area, and I so love being out by my waterfall. 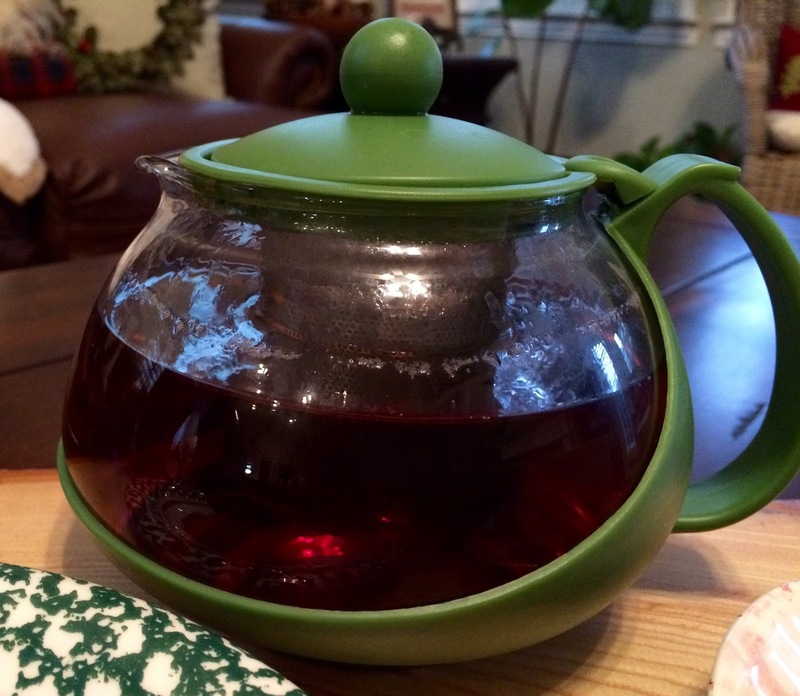 This cute seasonal teapot was found in a thrift store in Columbus, Ohio, last year. 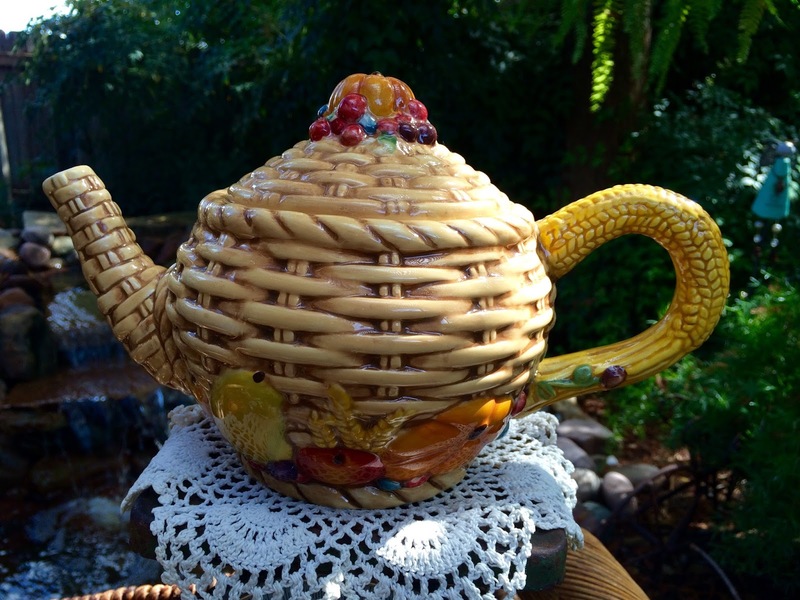 Don't you love the piece of wheat as the handle, the basket weave design, and the harvest of fruits and vegetables around the bottom? The top is a pumpkin with more fruits. It doesn't pour very nicely, but it sure is cute! 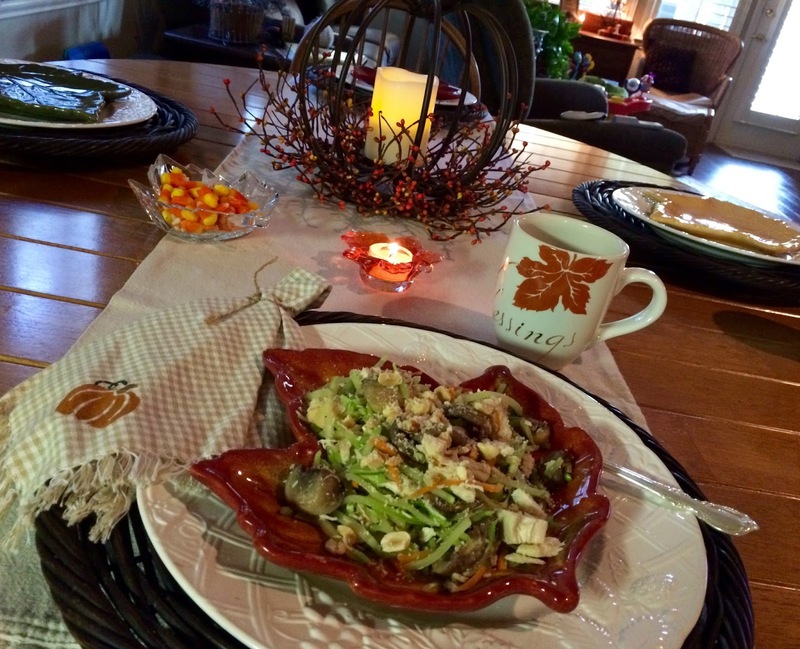 This yummy Fall treat is from Cooking With Carlee. It sounded so good to me and I've made it twice already! 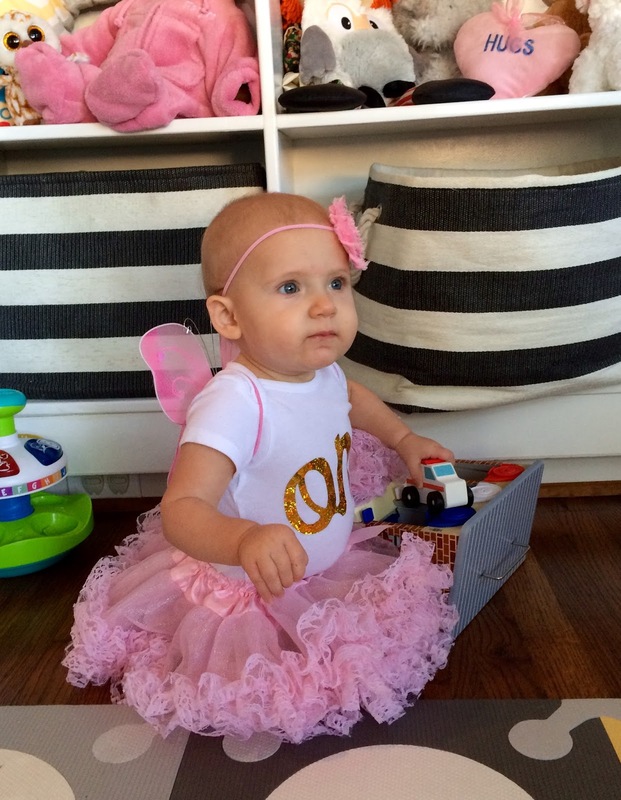 I asked Carlee if she minded if I shared it, and she was most agreeable. Thanks, Carlee! Her original recipe can be found here. I eat this for breakfast, along with my egg and melted cheese, fresh berries, and a cup of tea, but I also eat it as dessert at lunch time, after my salad. The recipe only has 1/4 cup of maple syrup, but it is sweet enough to satisfy my sweet tooth. I love that it has plain yogurt in it, too. 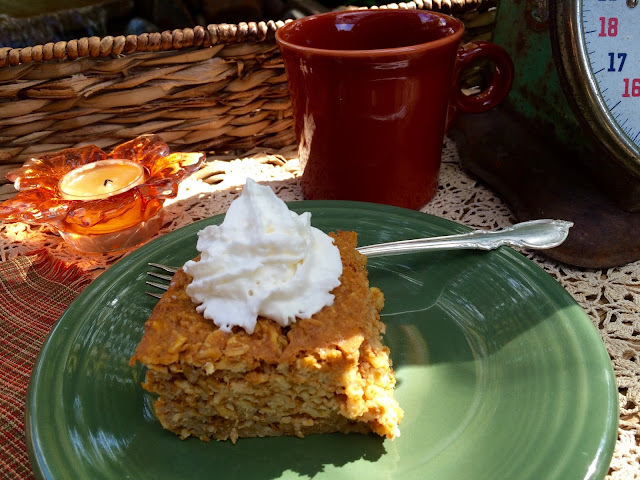 I had some leftover pumpkin puree in the freezer and this was an excellent way to use it. 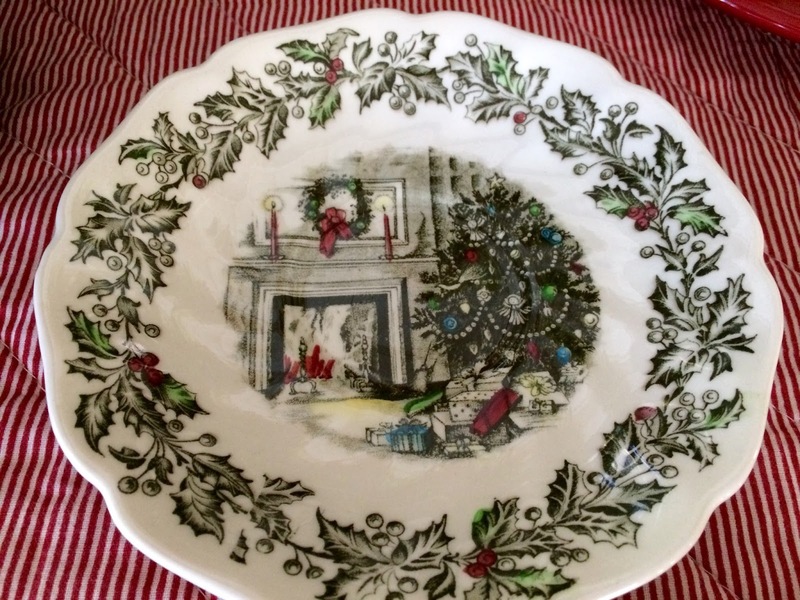 Preheat oven to 350 degrees, and spray baking dishes (use 6-9 ramekins, an 8x8 or 9x9 baking dish or equivalent). Whisk together pumpkin, syrup, eggs and yogurt until well combined. Stir in pumpkin pie spice, salt, baking powder and vanilla. Mix in milk and rolled oats, and pour into prepared ramekins or pan. Bake for 30-35 minutes in ramekins, closer to 45 minutes in a baking dish. The center should be set. 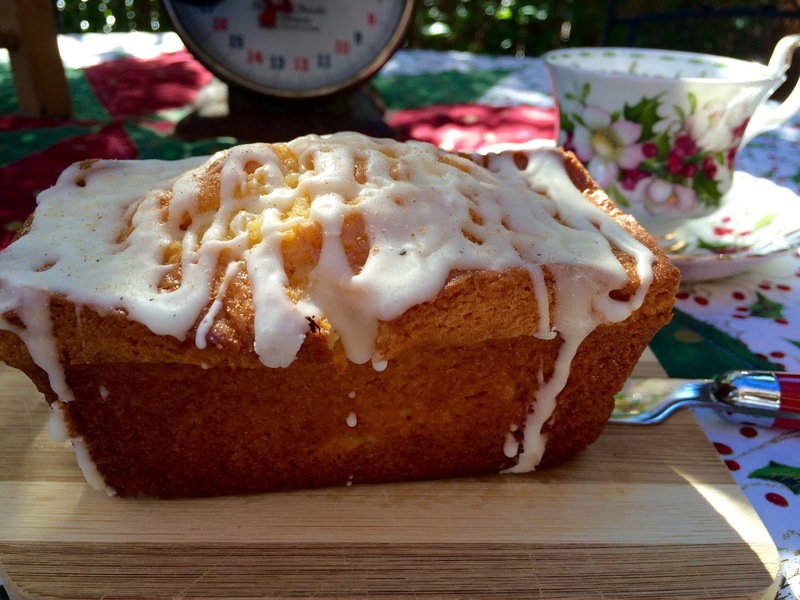 It's delicious served warm with some whipped cream or maple syrup. 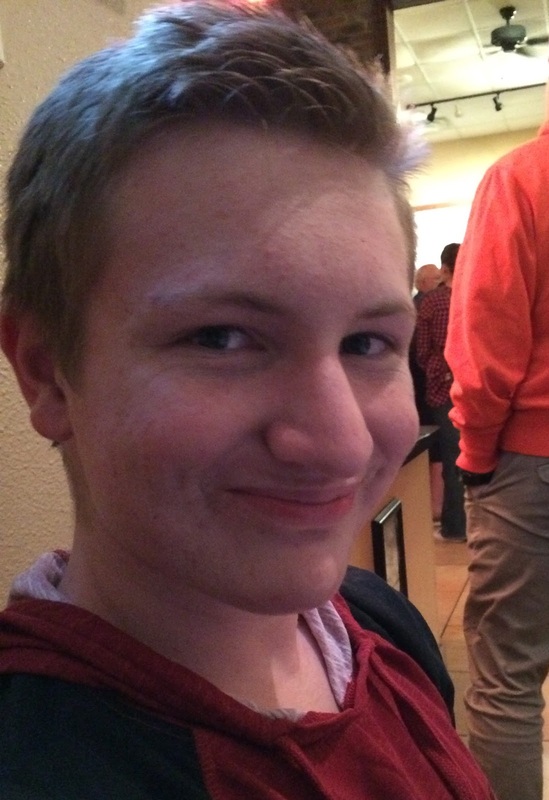 My son, who is here with me, warms it up and puts a scoop of vanilla ice cream on top! I get 9 servings out of this when baked in a square pan, and I just re-warm the serving in the microwave for about 30-40 seconds. 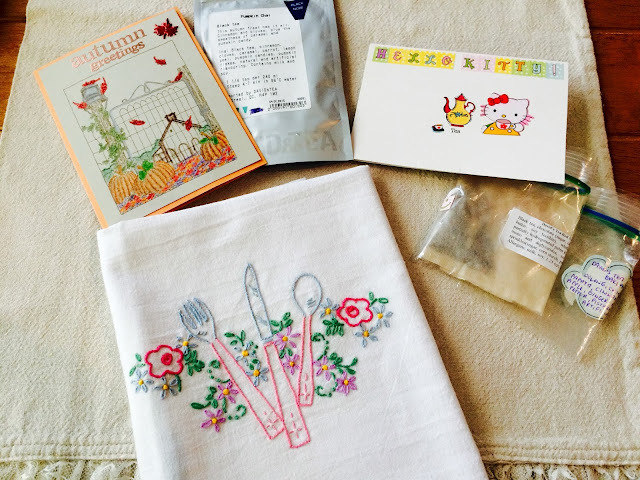 Recently, Margie from Tea in the Valley sent me three sample of David's tea and a cute Hello Kitty card that she made with fun stickers, shown on the right. The teas were Red Velvet, Chocolate Chili Chai, and a Baklava tea. They were all wonderful! Judith from Lavender Cottage and Gardening sent me some David's Pumpkin Chai tea (oh my!) and a beautifully embroidered tea towel, handmade from a fellow blogger, and a handmade card made by Judith. 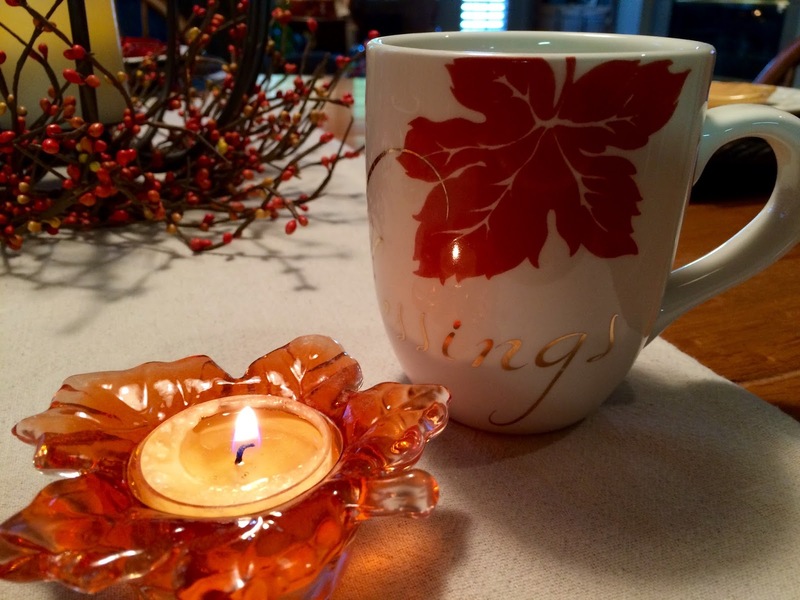 Aren't blogging sisters so thoughtful? 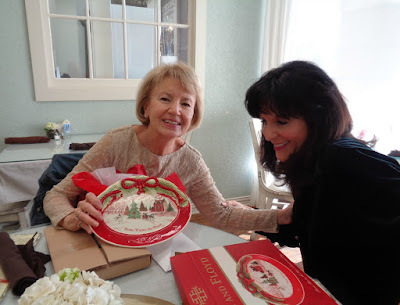 Thank you Margie and Judith!! Judith thought this towel was perfect for me and I certainly think so, too! 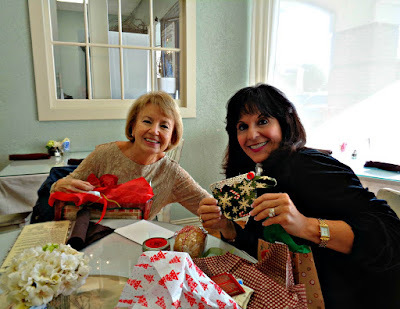 A group of ladies that I exercise with recently had a luncheon where we all bring something. I made this pumpkin shaped cheese ball using my favorite cheese ball recipe. 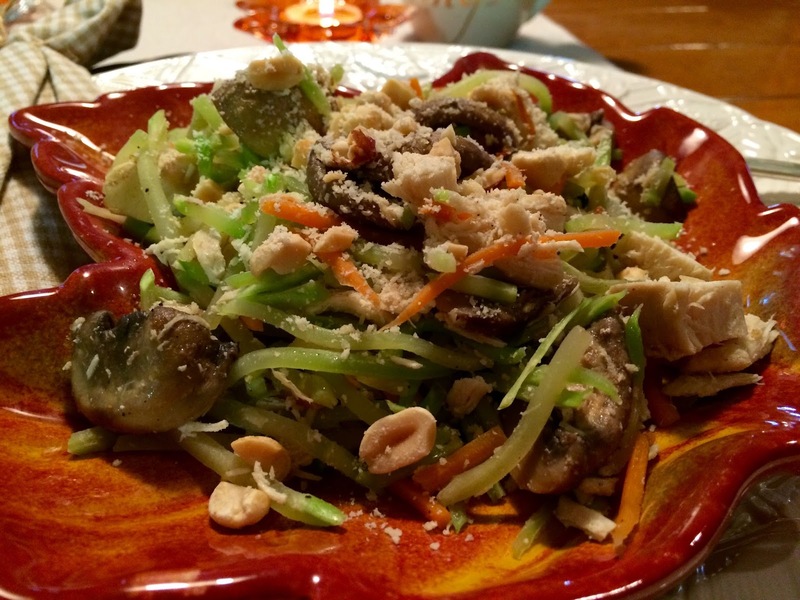 This would be a nice appetizer for Thanksgiving. I have to confess that I forgot to take a picture with the cilantro and had to come home after the party, and reshape the leftovers over a glass custard cup! The crackers are Trader Joe's Cranberry Pumpkin ones and they are perfect for this time of the year. Here's my nice, full pumpkin. I used a green pepper stem for the top of the pumpkin and for the vine used some cilantro, but parsley would be nice, too. Mix ingredients all together and shape into a ball, and wrap with plastic wrap. Refrigerate for two hours or over night. Take out and shape into a pumpkin. Score down the sides to resemble a pumpkin and place the green pepper stem on top, and add a couple of sprigs of cilantro.